Read on to hear some behind the scenes scoop from the authors of New England Knits, Cecily Glowik MacDonald and Melissa LaBarre. CR: Hey ladies! Why don’t we start by explaining how you know each other? We first met many years ago through mutual friends, but because we lived in different places, we lost touch. When Ravelry came into the picture we found each other again and discovered that we had both become a bit knitting-obsessed. The rest is history because we’ve been hanging out ever since! CR: I know firsthand how much a garment can change from sketch to final piece. Were there any garments in New England Knits that morphed or surprised you? Melissa: The Montague vest actually started as a belted sweater, but when I was about to sew in the sleeves I realized that I really loved it without them. After trying it on, it was officially a vest! Cecily: We actually had included a couple designs for men’s sweaters in the original proposal, but then decided it was more cohesive as a collection of women’s garments only. The Augusta Cardigan is a revised version of one of the men’s designs. CR: Time to play favorites! Which garment in the book is at the top of your daydream queue? Melissa: Oh boy, this changes almost daily for me. I think I need to knit myself a Hampton Cardigan. I love the construction, and I keep trying it on and dreaming about not giving it back to C.
Cecily: I agree, I keep finding a new favorite! From the sweaters though, I always seem to come back to the Salem Hooded Jacket, a hood, ribbon detail, and pockets! CR: Melissa, you just used Peruvia Quick and Vintage for your Acorns hat. Any other Berroco favorites? Melissa: Peruvia Quick is my absolute favorite right now. I’ve been daydreaming about a starting a new design in it. I am wool girl to the core. CR: Cecily, I just knit myself a Goodale because I needed a break from constant designing! Do either of you have any “cheat” knits that you sneak in between designing? If you weren’t a professional designer, what would you be working on right now? Cecily: Can I put a big disclaimer on this? I am not saying this to be nice, it is absolutely true- I bought the pattern for Kiloran [Ed: Kiloran is a dress I designed for Twist Collective in Ultra Alpaca], just so I can just have it at the ready for when my workload slows down. I have been dreaming about it since the new issue of Twist came out! CR: Summer in New England is coming to an end. What is your favorite part of New England summers? What are you looking forward to in autumn? 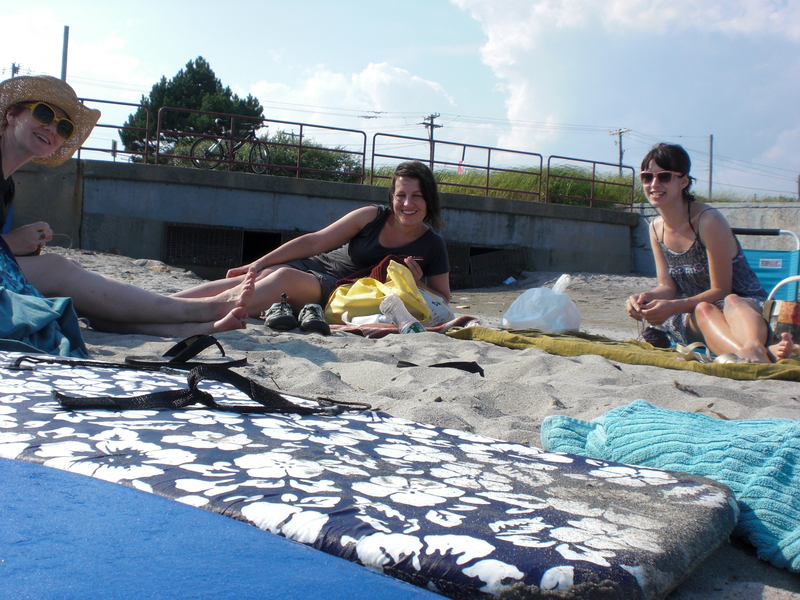 Melissa: I really enjoy knitting on the beach, and just being near the ocean, but I can’t wait for SWEATER WEATHER! Cecily: Definitely being able to spend time by the ocean is my favorite part of New England summers. However, after this particularly hot summer, I am really looking forward to the cool, crisp fall air. CR: What’s next for Cecily and Melissa? I love this book and would really like to enter the conteat but Im not sure how to enter. Will leaving a comment here enter me? Sorry, I’ve edited it to make it more clear! If you click the picture of the Northampton Kerchief it will take you to the entry form for this contest. Good luck! I LOVE this book and I am actually making the Montague Lace Vest out of Berroco Campus and I LOVE it so far and how great it’s knitting up. Ooh, that sounds cute! Campus is a fun yarn. Great interview…and a wee bonus to see our little photo from the beach! Hi Gudrun! I have a few other pictures from that day I need to upload…including that gorgeous snake! I recently purchased the book and loving many of the patterns. I’m looking forward to the Fall. Vermont is so pretty that time of year. I’m loving your dress in the beach picture. I know I’ve seen that dress somewhere but can’t remember where. I picked it up at H&M and it has been a summer favorite! i am making phinney and am confused about the sleeve cap directions. i am reading the last 2 sentences. do i decrease 17 stitches and have 29 remaining- then decrease 17 stitches again to have 12 stitches remaining or do i decrease 12 to have 17 stitches remaining? Hi Gail–you decrease 17 stitches in both rows. Previous article Twist and shout!